My first night back at Thanda and what do you think woke me up? … Thanda’s dominant male Lion was roaring this morning and it sounded as if he was in front of my door. The sun had not risen yet, it was still quite dark. I got up and opened my front door to see the large male crossing the road outside the gate. I had no camera in my room so I grabbed my iPad and took this (very marginal) image of the male disappearing into the grass. See if you can spot him. A bad image, but what a wake-up call! My guess would be down the fenceroll behind your car. Glad you had a safe trip home. Have a great one. He was just welcoming you back. Thanks for a great presentation Friday. Make that 3! No doubt he is happy to have you back. As much as you see him, he sees you, too. Actually, he probably sees you more often. I also enjoyed your presentation and all those new facts you shared with us. 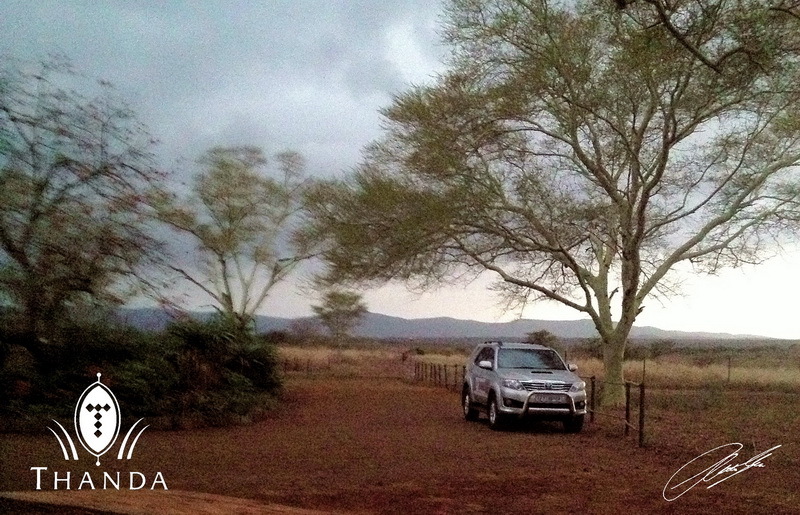 It’s easy to see that there is never a dull moment at Thanda. Having a wildlife opportunity without the camera usually means you have a rare chance to watch it unfold without having to record. Looks like it was great…. Thanks for your comment Heidi – I am glad you enjoyed the presentation – it was great to be back in Nashville for a while and I hope to be back soon for another visit. Thanks for your comment Karen – There are always exceptions to the rules 🙂 ……. Thanks for your comment Kerry – I am glad you enjoyed the presentation – it was great to be back in Nashville for a while and I hope to be back soon for another visit.